Best-selling author Adam Freeman shows you how to use Angular in your projects, starting from the nuts and bolts and building up to the most advanced and sophisticated features, going in-depth to give you the knowledge you need. Chapters include common problems and how to avoid them. 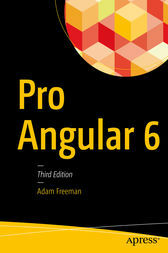 Additionally, this book now has accompanying online files for Angular 7; all examples in the book work without changes in Angular 7.